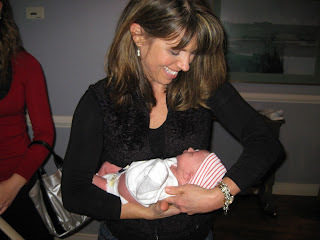 The Pastor's Wife: A Grandma was born! Now I really don't mind this. I know it is done in a loving manner. They know I am thrilled at this development (note my face in picture above), but in my family we used the term "mamma and pappa" (pronounced ma-maw and pa-paw) instead of grandma and grandpa. Grandma was just a title that was used in establishing the position on the family. I know that it isn't just about what I prefer, but what the parents and ultimately the child decide what my name will be. Whatever Micah decides to call me will be music to my ears. But everyone else can call me "Mamma," especially the 40 year old and older crowd. Then again maybe the term mamma should be reserved for the younger crowd! So what term did you use to refer to your grandparents? On my Dad's side, my oldest cousin could not say Grandpa, and said Papie, so that was his name, Grandma and Papie. On the other side it was just Grandma and Grandpa. My kids call both sets of parents plain ol' Grandma and Grandpa. Sometimes us kids (esp my brothers) will call my Dad "Pa" now that he's older. Like a little house on the Prairie thing, since they literally have a little house on the prairie now! For me it was always, Grandma and Grandpa. My mom made sure that's what we called both sets of grandparents. Interestingly enough, all my mom's grandchildren call her "Nanna" and call my father "Poppy." we use mama, grandma, granny, nana we have so many grandmas with us. one is called bubba, but that might not be a good fit for you. I'm hoping cece sticks with me. Maybe mama cece. I like it.